Hetland Hall Hotel is an elegant Georgian country house with dog friendly bedrooms available. 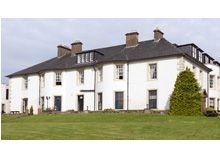 Set amidst 18 acres of private parkland which has sweeping views over the Solway Firth. Just 5 minutes from Dumfries and 15minutes from Gretna, Hetland Hall is ideal for exploring the natural beauty and history of Dumfries and Galloway with your dog. 8 miles from the centre of Dumfries, Scotland.